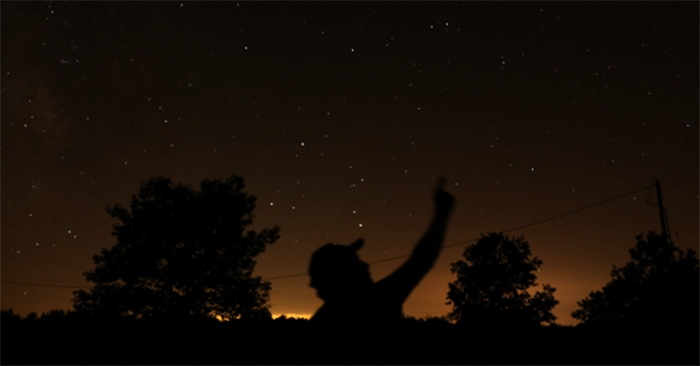 A starry-eyed observer points to the night sky at Middle Fork River Forest Preserve. IDA today announced the accreditation of Middle Fork River Forest Preserve in Champaign County, Illinois, U.S., as an International Dark Sky Park, that state’s first such designation. The result caps a two-year effort to achieve the status in a collaboration between the Champaign County Forest Preserve District and the Champaign-Urbana Astronomical Society. Middle Fork River Forest Preserve is a 688-hectare site in eastern Illinois, U.S., one of six public preserves owned and operated by the District. It protects a restored prairie rich in native wildflowers and grasses, and its landscape features a variety of habitats including upland oak forest, restored prairie and river bottom forest. Hiking, wildlife viewing, and fishing are popular activities in the Preserve. The Preserve is also a dark nighttime refuge for wildlife in the midst of significant skyglow from nearby cities such as Urbana, Champaign and Rantoul. Concern for the area’s night skies began in 2007 when members of the Champaign-Urbana Astronomical Society (CUAS) lobbied for changes to street lighting in the jurisdiction of Champaign, the largest municipality in Champaign County. In the same year, CUAS began collaborating with the District’s Education Department to offer ‘Starwatch’ astronomy-related stargazing programs at the Preserve. We could not be more grateful to the International Dark-Sky Association and the C-U Astronomical Society for their work in protecting one of our greatest natural assets – the star-filled night sky. Located in the darkest corner of our county, Middle Fork fit all the criteria for Dark Sky Park status. We now have the opportunity for everyone to recognize it too,” stated Mary Ellen Wuellner, Executive Director of the Forest Preserve District. In 2016-17, the District spent over $20,000 to upgrade the Preserve’s outdoor lighting to meet IDA recommendations, and new interpretive programs educate the public about the benefits of nighttime darkness and interpret the lighting retrofit project to Preserve visitors. The new programs also provide an opportunity to showcase the new dark-sky-compliant light fixtures installed at Middle Fork and offer suggestions to the public on how to limit excessive nighttime light in their home environments. The importance and benefits of darkness and a star-filled sky now play a role in all of of the Preserve’s nighttime programs. “Our funding partners – the Illinois Clean Energy Community Foundation and the Community Foundation of East Central Illinois – and many private donors made it possible for us to switch out all the exterior lighting at Middle Fork to fully-shielded, dark sky-compliant fixtures. This really was a team effort,” Wuellner explained. In recognition of its newly dedicated International Dark Sky Park status, Middle Fork River Forest Preserve will celebrate with the public during International Dark Sky week, March 31-April 6, 2019, by throwing a star party. The Champaign-Urbana Astronomical Society will join the District in ramping up night-sky related programming at Middle Fork, while visitors who camp in the preserve’s campground will continue to have nightly access to the park’s dark skies.